For software projects with a large amount of code it is essential to emphasize maintainability. Continuous Integration Systems, such as Jenkins CI, are good instruments to simplify and monitor your builds in an automatic way. An advantage of Jenkins CI – the possibility to integrate some, possibly self-written plug-ins – is the topic of a small project that could be helpful for some Jenkins/Hudson-using developers. SVNFolderParameterPlugin is a plug-in that provides forms for parameterized builds where you can browse in a Subversion repository for a subdirectory in a specified directory. Together with a custom check-out script, this allows building Jenkins jobs which run against arbitrary source code versions in your Subversion (e.g., in order to rebuild a tagged version). When starting the build, all subfolders will be shown in a dropdown list and the URL of the selected folder will be forwarded as a property to the build script. When it comes to testing the GUI of Java applications, you’re typically faced with a tremendous amount of readily available testing tools for AWT and Swing, in all states of development, and all kinds of packages, be it standalone tools or some kind of plug-in to your favourite IDE. Now there’s more than just AWT/Swing. Once you start developing your first Eclipse plug-in, you’re bound to come across SWT, the GUI framework of Eclipse itself. Looking for tools capable of testing SWT-based applications is quite some task, the primary source for hints being some secluded mailing lists’ archives. The task gets even tougher when you’re setting more constraints: support for the Graphical Editing Framework (GEF) and robust Capture-Replay functionality, for example. 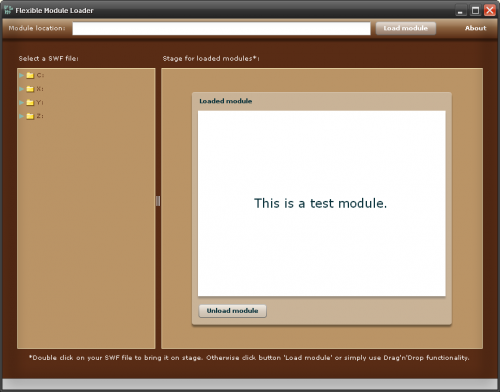 A common way to load code during run time in a Flex 3 (Air) application is using Modules. This special type of dynamically loaded SWF files allows the application to load separate parts that it requires only when it needs them. The user experiences shorter loading times due to smaller SWF file size and the developer can separate features into single modules that he can work on independently. So far so good but unfortunately they cannot be run in a stand-alone way. Instead they must be loaded in an application. This makes it rather complicated when it comes to testing. If you have an extensive application with lots of different functionalities which are encapsulated into many different modules it can be very annoying to deploy the whole application just for testing only a small aspect. At this point the ‘Flexible Module Loader’ (FML) is going to be a very helpful tool.